I'm here to tell you that if most of your value to your members is based on #1 and/or #2, your value proposition is at serious risk. It is crucial you dig into your members daily lives as professionals and businesses and understand what are their big challenges. Members are spending big money on outside consultants to fix problems in their business that the association could be spending. Engaging members in programs "together", where they can leverage their budgets and maximize their performance, is the perfect type programs and services associations should be pursuing. 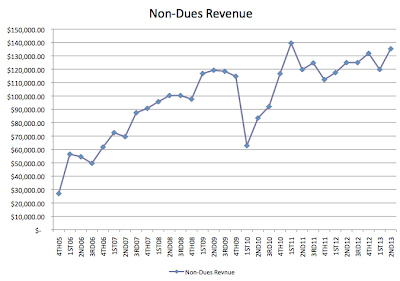 Effective non-dues revenue programs that are meaningful to members can have a dramatic impact on an association's budget. Once our association began to dig into meaningful programs for our members, our non-dues revenue began to grow like crazy through member engagement. 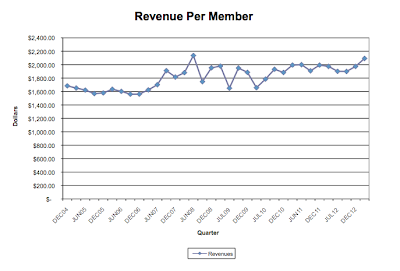 The following graph illustrates the impact the programs have had on our associations "per member revenue." At one time, we took in about $1,550 per member on an annual basis. Now our association generates over $2,200 per member. That is an extra $227,000 a year in revenue. 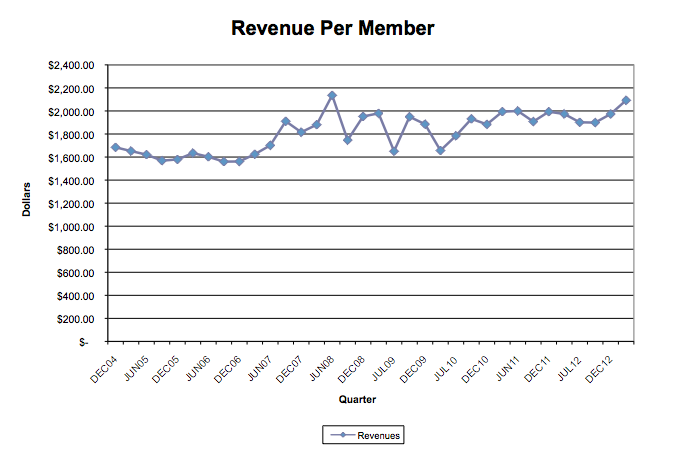 We would have to recruit 126 new members to equal that same revenue. As we all know, it is a much cheaper investment by the association to get current members to spend more money with the association than it is to recruit new members. As you can see, our non-dues revenue has grown from less than $30,000 a year, to now almost $140,000. Since its inception, our online academy has been able to deliver high quality content, in a user friendly environment, at a significant savings to our members, while driving extra revenue to the association annual budget. I highly encourage all associations that do not have an online training strategy to seek one out. If you have content in any format, or an industry professional you can partner with in a revenue sharing arrangement, you are sitting on the same opportunity to drive new revenue to your association. It is proven by studies that companies that train their employees have higher morale, more confident employees, less error rates, higher gross profits, embrace change and accept technology easier. Associations need to brand that thinking in order for members to take training serious. They need to see the positive impact training will have on their career or business profits/productivity. Associations typically have content without even knowing it. If you have written content, videos, power points, or past conference sessions, you have content to consider for your online learning center. If you don't have that, you may have an industry professional, who for a 2-year revenue sharing opportunity, would create content for your association. We gave an industry professional 20% of course revenues for two-years and he created 43-hours of videos, power points, and tests for us. The point is, every association has content. You just need to find it with yours, get it online, and sell it. We have found, employees love to accomplish training goals, and employers love to post those certificates of those who reach their goals. It looks good to customers and motivates the other employees. Certificate programs are easy to create. You don't need to certify that someone is qualified at a certain level of performance...that comes with liability. What you can easily create is a certificate program that certifies a person has taken at least so many hours of training and worked for at least a certain period of time in the industry. The certificate demonstrates they have had some minimum level of knowledge based, and on-the job training. 99% of our training engagement comes from members who purchase an annual subscription for unlimited use of our online learning academy. With the financial cost structure we had with our LMS, it made it possible for us to take the video rental model of purchase courses one at a time for a certain price, or pay a higher price and get unlimited usage of our over 200 hours of training for your company. Members jump all over the unlimited subscription model given it was highly competitive, provided them a group account to track all their employee's progress, and everything was tracked online, so it fixed their training budget each year. In closing, I would encourage anyone reading this post to research and explore an online education strategy.